To kick things off the reigning Mrs. Rhode Island of the Mrs. America franchise welcomed the crowd with a message from the title sponsor and threw out a ceremonial first pitch. Proudly displaying her 'blue bull' t-shirt and tiara, she then took up residence in the Cox Fan Center where she spent some time signing autographs and taking pictures with eager PawSox fans. Novo Nordisk and the American Diabetes Association each set up tables in the Main Gate Entry Tower to greet fans as they entered the stadium and distribute literature. Ever supportive of non profit organizations, Novo Nordisk agreed before a pitch was even thrown to donate $500 per home run hit by either team that day to the Pawtucket Red Sox Charitable Trust Foundation with the understanding that the half of the final tally would then be given to the Massachusetts American Diabetes Association. 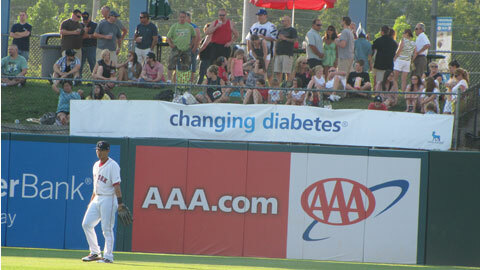 If a batter were to hit a HR off of the 'Changing Diabetes' sign in left/center field the organization would then donate $5,000 to the PawSox Foundation. While there were two round-trippers hit during the contest, by Buffalo's Zach Lutz and Pawtucket's JC Linares, Novo Nordisk doubled their obligated contribution making the total contribution $2,000. Representatives from both organizations will take part in a pre-game check presentation on August 31st. There are two main types of diabetes, Type 1 and Type 2. Those who suffer from Type 1 are born with a genetic pre-disposition to the disease, while those with Type 2 develop it later in life and suffer from insulin resistance and relative insulin deficiency. Both require control through diet, exercise and consistent monitoring and adjusting of blood sugar levels. If you are living with diabetes or know someone who is, visit Cornerstones4CareTM at http://www.cornerstones4care.com for tools to help your care plan work harder for you, ongoing updates about diabetes care, and tips and inspiration to keep you moving forward.